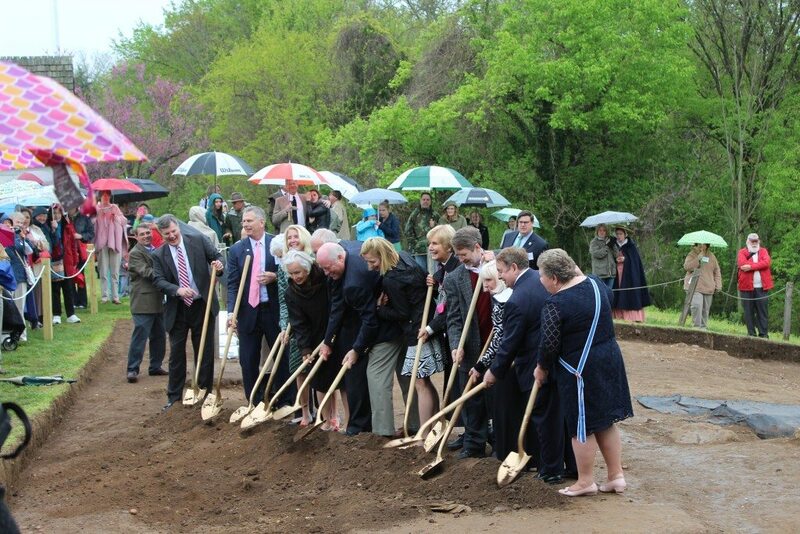 On April 25, 2015, Germanna Foundation Trustee Dr. Michael Frost was an honored groundbreaker for the George Washington Foundation’s first phase of construction for the Washington House at Ferry Farm, George Washington’s boyhood home overlooking Fredericksburg, Virginia. (Michael is the second from the right in the photograph). The Ferry Farm venture’s first phase will build an “interpretive replica” of the Washington house on its archaeological footprint, the farm’s kitchen outbuilding, a slave quarter and a storehouse, as well as recreate the period landscape. Also attending the ceremony were Michael’s wife Ginger, Germanna Foundation Trustee Skip Poole and his wife Joy, and Germanna Foundation Archaeologist Dr. Eric Larsen (who has worked at the Ferry Farm archaeological site). Keynote remarks at the ceremony were delivered by Doris Kearns Goodwin, world-renowned presidential historian and Pulitzer Prize-winning author, and other speakers included Fredericksburg area philanthropist Ms. Doris Buffet. Dr. Frost’s leadership and generosity in telling the story of America’s history is not limited to the Germanna Foundation. Germanna is glad to see this historically important site from our region of Virginia venturing off on such an ambitious and significant endeavor.